Is this an Indian Decca chillanum/chilanum dagger, 17th century? And what is it worth? This is not a chilanum dagger. This particular dagger is in the Met Museum, here is its description and a link to my Pinterest board with images of chilanum daggers. Nicely done, Eric - every board gets its trolls and it's good when they can be squashed early. 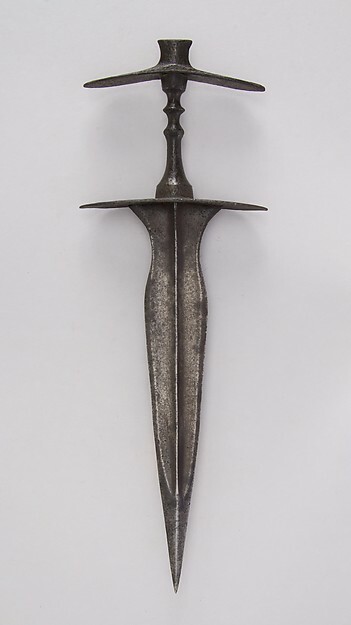 Victor, this was an easily remembered dagger as I recently made a Pinterest board with every Indo-Persian weapon from the Met Museums collection that has images. I also created many new images from the images that are high resolution. It is a good resource. What is amusing is that, after I posted, the guy PM'd me to see if I knew the value. I was tempted to tell him that, if the dagger is actually in his possession, then the news stories that come out about the stolen artifact from the Met are likely to give an estimate.